It is not hard to come by leftover steak, whether its the remnants of a big grilling day or the doggie bag from your favorite steakhouse. It is, however, often hard to recapture steak's magic the next day. The primary challenge behind this is keeping the steak moist, as cooking it twice will tend to create a bone-dry piece of meat. Fortunately, with a simple plan of attack, you can re-experience the tender juiciness of your steak, even though you reheat it. Dehydration is the first and largest problem in reheating steak, as the less moisture the meat retains, the tougher it will be. Defeat the problem by keeping the meat hydrated. 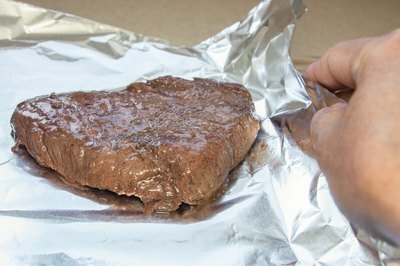 You can wrap the steak in foil so that its own juice will not evaporate overnight. Before you recook you steak, you can also leave it to sit overnight in the marinade of your choice. Do not, under any circumstances, completely recook the steak. This will chase the remaining moisture out of it. Instead, cover it and let it naturally reach room temperature. Pre-heat a skillet on the stove to high. Brush the steak with butter or oil and flash sear it for just a few seconds on each side. Then, reduce the temperature of the skillet to low and fill it with enough water or red wine to cover the steak. Season to taste with Worcestershire sauce, vinegar, or another favorite sauce or condiment. Once the water begins to bubble, remove the steak and enjoy. If you're eating the steak yourself, add a side or two and you should be good to go. However, if you are feeding others, your leftover steak may not be the centerpiece of an entree as it was the first time around. Instead, consider presenting it as the hearty base of a salad or an ingredient for stir fry. 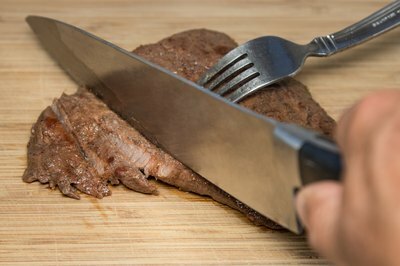 Finely slicing steak and sauteeing it is an excellent way to reuse it in a way that offers the greatest flexibility. Reheat beef tri-tips without drying them with this tutorial from eHow Food.